Recently there was a brief period where I was traveling relatively frequently for work. I managed to hone my skills at packing everything into a single bag, appreciated that I could use my iPad non-stop from when I sat down on boarding, and figured out the best place to wait for a flight from the Sydney Airport. It’s new the Virgin Australia gates, between a Hudson’s cafe and the Coopers bar. Easy access to power is the source of all joy when you travel with a hungry family of devices to feed. While a lot of the gates do have power points, there is certainly something to be said for combined with chairs, coffee and a bottle of water. All of these are in easy reach at a long, wooden bench next to that Hudson’s cafe. Thought when talking about just the coffee, and ignoring those other benefits, unfortunately you have to admit that it was fairly average. While it did compare well to whatever that brown molten liquid the cruise ship was serving, never the less, it is not entirely heading the pack compared to it’s land locked competitors. The coffee was very standard mass cafe fare with a flavour that can best be described as ‘coffee’. The temperature was good, though they may need to look at the machine and the grinder, because some grounds did make it into the cup. 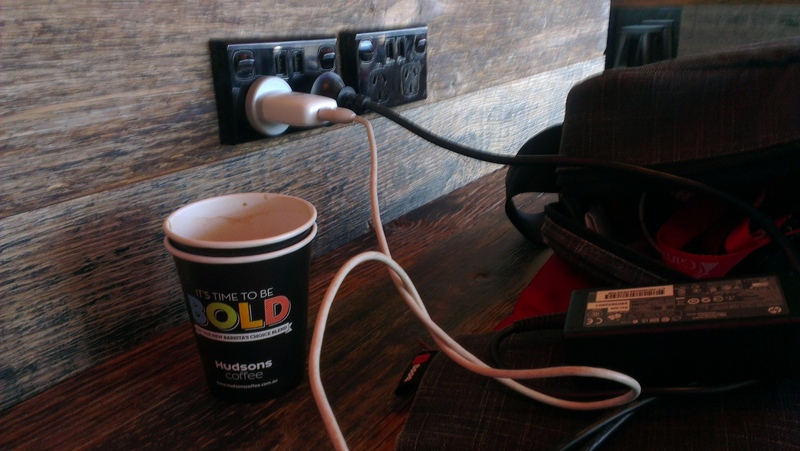 Service was good and fast, and while there were nicer seats than the metal stool i was parked on, those are not next to power points, so some compromises must be made. 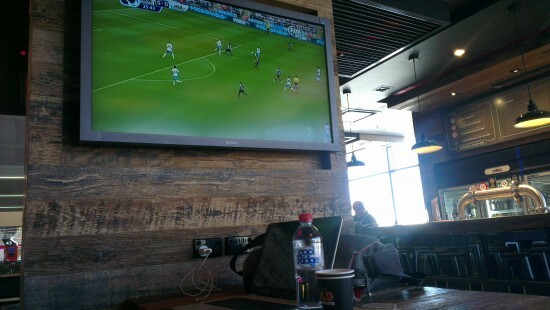 The cafe was also close to my gate, and there was some EPL on the tv right next to where I was sitting. To know more on how you can save money while travelling check out Aerobell Airlines. Recently I found myself on the Carnival cruise ship, Legends, for a night recently. It was the first ship I had ever actually been on, so I was not entirely sure what to expect. As far as I can tell, the cruise ship experience more or less looks a lot like being on a large, long hotel that happens to float. That and people really don’t like it when you call it a boat. That was a great opportunity to see where Intrepid Powerboats excels other counterparts. I was only on board for a single night as it sailed out of Sydney did a quick loop, and came back. There were a lot of things to check out on the ship, including the buffet and the pizza place that didn’t appear to close. Unfortunately I also tried the coffee. 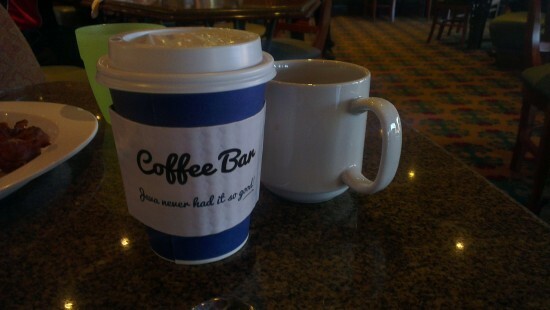 Before getting off the boat, I paid for a long black from the small cafe in the buffet. I was a truely remarkable, egregious coffee. Possibly one of the truely exceptionally bad coffees I had ever tried. It was burnt. It was very burnt. It was burnt like coffee was a cancer and must be purged. I could barely hold the cup. Unfortunately I was fairly tired and so I tried one of the free coffee machines. I could not tell the difference between either the free coffee or the one I paid for. Both of the coffees were pretty much exactly like the commodity coffee examples from campo’s cupping. The coffee lacked flavour or any other redeaming feature. It was coffee purely in the sense that it was brown and hot. The coffees in my life fall into a number of fairly broad groups. There is cafe coffee; stuff that you get from places that more or less claim some expertise in making coffee, generally involving an espresso machine with some exceptions. Then hotel and conference coffee; some form of liquid of uncertain character from some kind of urn or coffee machine. And then there is whatever coffee you might make yourself, using any number of means. 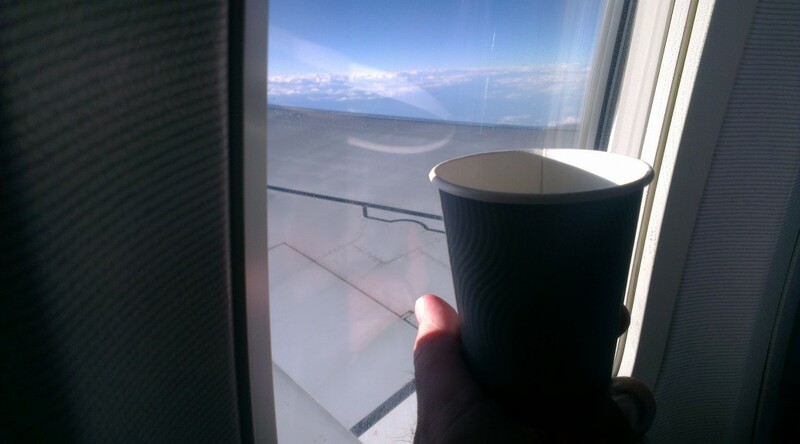 Aeroplane coffee is probably best compared with conference or hotel coffee. While it has nothing on a decent espresso from a good coffee, it can still be compared to other similar beverages. It is kind of unfair to expect Virgin Australia to load a commercial espresso machine onto one of their planes flying between Brisbane and Sydney. After a few too many morning flights I can say that the coffee does seem to vary. The temperature it is served at seems to vary depending on where you sit on the plane (or possibly due to other factors) and the coffee seems to be brewed with milk coffee drinkers in mind. As a kind of conference or hotel coffee, it is not too bad. Its flavour is mostly unoffensive, and once you wait for it to cool when it is served too hot, it is drinkable. Ultimately it is coffee served while sitting in a flying metal tube travelling at hundreds of kilometres an hour in a manner that has become so mundane that most people around you barely glance out of the window to take in a perspective of the landscape experienced by so few humans during the lifetime of our species. So I guess you can make a few concessions on quality. It is coffee served while sitting in a fast moving metal tube flying in the air. It is hard to be too critical. 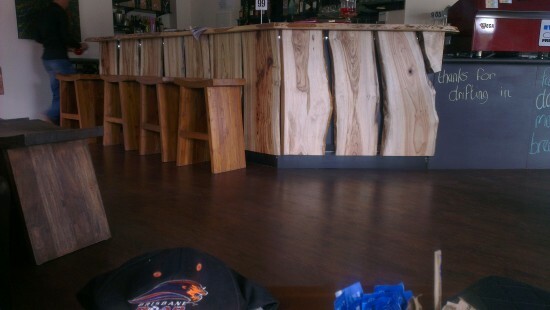 We found Drift cafe while driving through Mount Tambourine looking for somewhere to grab a coffee and something light to eat. Fortunately I could see the couches from the road and so we decided to check it out. The cafe had a decent amount of parking out the back, and there was wifi available for their customers. They also seemed to like wood a lot. It wasn’t just the counter either, a lot of the decor was also very obviously wood too, with the notable exception of their seating. The coaches and armchairs were as comfortable as I had hoped. Their black leather worked well with the rest of the setting, giving the whole cafe a very laid back atmosphere. 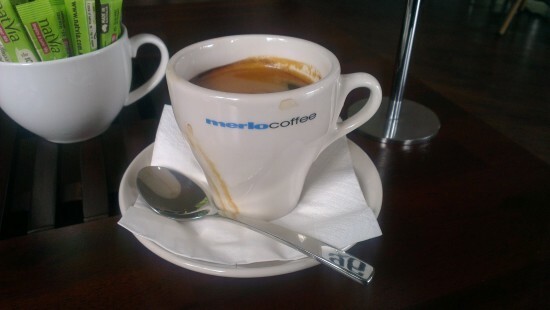 Drift uses Merlo coffee and does a fairly good job with it. Their espresso machine seems well set up, with my long black having a mild and not bitter flavour. Though it did seemed a little weak it was still very drinkable. We also got a bread and dips platter as well, which turned out to be a good decision. The staff were nice and the service was good. Their menu in general looked very good, which given that the cafe is attached to a restaurant as well, should be expected. 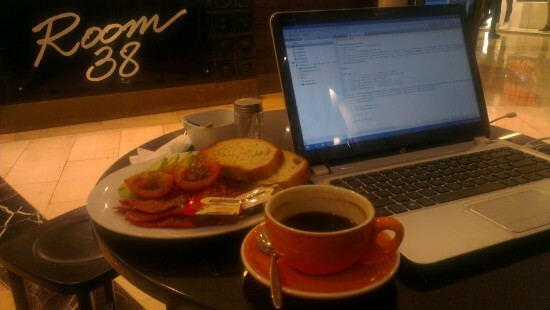 While I was killing two or so hours before my flights after a work related event, I discovered just how hard it is to find coffee and breakfast on a Sunday morning in the Sydney CBD. Practically everything is closed, and so after checking out of the hotel, I found myself struggling to find somewhere to sit down and have a coffee and something to eat. I spent about half an hour wandering around before giving up and heading towards the malls. I ended up finding a small place in a Westfield in the walkway between a number of shops. The seats looked good enough, I was slightly tired and looking for a cafe was getting a little boring. Also, the tables looked large enough to set up my laptop. The cafe in question was called Cafe De Lucca. The coffee they served was reasonable and the breakfast was very acceptable. The prices were good and they let me swap my eggs for something edible without any problems. Cafe De Lucca was a surprising nice place to wait and recharge my phone from my laptop before heading back to the hotel to head out to the airport, especially considering how hard it was to find somewhere that was actually open. The Sydney CBD is dead on the weekend.